If you hated your prom, loved your prom, or missed it entirely, this Saturday at Pops Bar is your opportunity to make new memories to compliment or replace your emo teenage feelings. 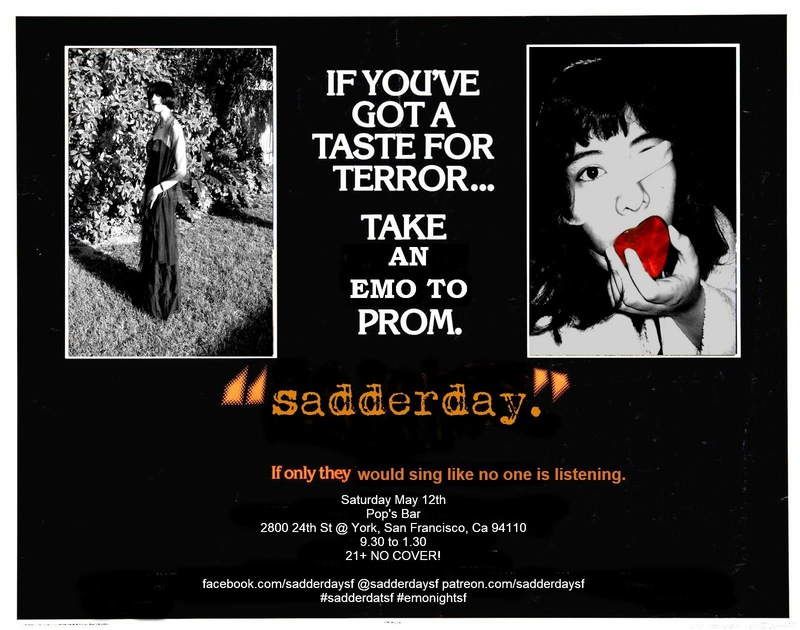 Sadderday SF presents a Class of 2018 Emo Prom with DJs Kevin Kannibal and Ashley Suicide spinning emo, pop punk, scremo & electro. Wear your best or worst or most beloved formal attire, bring someone special, or meet someone new. These are the best days of our lives. And don’t worry, there will absolutely be a prom court to be voted on so get ready to do your best wheelin’ and dealin’. Rockin’ out early ’60s & ’70s CLASSIX: Beatles, Kinks, Stones, Hendrix, Doors, CCR & many more! Down To Funk is a new monthly at Pop’s Bar featuring funky grooves and soulful rhythms that will make your booty shake and your head nod. Resident DJ’s Mooselini the Soul Fascist (Mustapha Popal), Ohhellnoel (Noel Dunlap) and D.Hop (Dave Hopkins) will be providing the soundtrack for the night. Come join DJ Sonny Phono as he curates a night of new and classic Independent/Underground California music. We Out Here is a new concept where the DJ plays music made by friends/acquaintances keeping the basis in Hip Hop/Rap/Funk he’ll throw in some remixes of his own and some of the best Dj’s he’s built with over the years. Come by, you might just hear your original music in the mix! Open Mic Cypher hosted by Tino. Lonesome Lester plays three kinds of music: his music, old music, and his old music. Armed with a ukulele, occasionally joined by an acquaintance or two, Lester plays Tin Pan Alley favorites as well as his own songs…which sound like Tin Pan Alley favorites. It is the most magical time of the year, when you can ask that special person to go with you to a school party that has garnered social significance! If you hated your prom, loved your prom, or missed it entirely, this is your opportunity to make new memories to compliment or replace your teenage feelings! Wear your best or worst or most beloved formal attire, bring someone special, or meet someone new there. These are the best days of our lives. Happy Mother’s Day from Pops! Don’t you think Mom deserves a cocktail? 3 Words: Bacon Bloody Mary. Need something funky for your weekend wind down? Every 2nd Sunday, Pablito and friends bring you IN THE CUT. Old and new hip-hip, fresh-groove bangers, classic soul hits and everything in between. Stop by for tasty drinks, share your smiles in the photo booth and shake some damn tail feathers! Whatever your flavor we’re sure to keep your head boppin’!